My interest in art began as a child in Pennsylvania, drawing and sketching, then taking art elective classes in school and informally afterwards. While raising our children and in later years, I was a start/stop artist. Now that I work fewer hours, I have more time to devote to brush and canvas. I still love to paint Pennsylvania farms and livestock, which remind me of 'home.' Several trips to Tanzania provided great reference photos of African animals. And the birds and scenes in Florida persuade me to paint them as well! I enjoy the challenge of painting beautiful things in nature and take my camera everywhere to gather reference material. 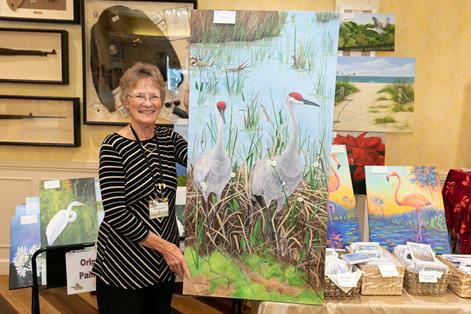 Leda at the Villages Art League's Fall Show on October 27, 2018 (taken by Dave Boege, photographer). Several years ago I was asked to paint portraits of my daughter's pets, which has become a new favorite. This has been received well; I've been commissioned for more than 90 pet portraits. Wouldn't you like a portrait of YOUR best buddy?! Art works of four artists were featured in The VILLAGES INVITATIONAL PAINTERS exhibit at the Laurel Manor Recreation Center. I was one of the participants in the VIP exhibit running from October 11 through January 2, 2014. The painting 'Making Hay While the Sun Shines' was accepted into the first TOAST TO THE ARTS exhibition at the Appleton Museum in Ocala, Florida. Opening on November 2, 2013, the show continued through January 4, 2014. In 2015 a call was made for artists in The Villages to paint one of ten murals for the new Rohan Recreation Center. I was chosen to paint 'Lake Sumter Lighthouse' on the 6'x7' canvas. It is displayed in the Eisenhower Room of the Rec Center. Click here for details. A Village of Fenney Art Contest was announced for artists in The Villages to submit paintings depicting Florida. My entry of 'Sandhill Pair With Youngster' was chosen to be showcased upon completion of the Fenney Recreation Center in 2017. My paintings can be ordered as note cards. Click here for details. Also, some can be seen and ordered as prints, cards and other articles from Fine Art America. Leda with her mural at the Rohan Rec Center, taken by Dave Boege, photographer, during the VAA Fall Art Show on September 22, 2018.